Fireplace mantle décor, central to a common area, should be carefully chosen. These photos show fireplace mantle decorating ideas. 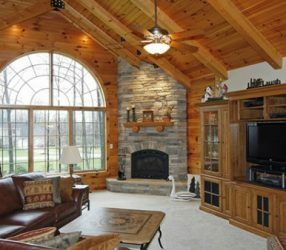 Your fireplace is front and center, a main attraction in your Great Room. And often the most used sitting and visiting area is situated, in front of the fireplace. 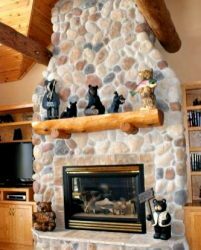 Bears, all kinds, are a popular theme in log and timber homes. Here you see bears used as a theme for this fireplace mantle decor. The whimsical bears are engaged in various activities and each will win your heart. 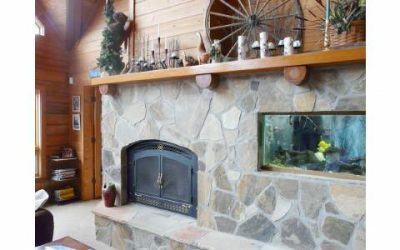 Note the cobblestones in the fireplace and the half log mantle. 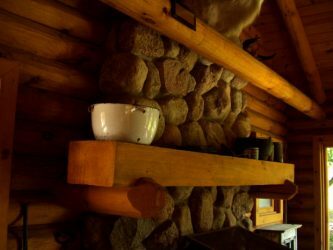 This log home has flat sided logs on its inside wall, with white chinking. The fireplace mantle decor has a candle theme, which serves to accentuate the beautiful picture above the mantle. A silk garland adds color and brings more of the outdoors into the fireplace area. 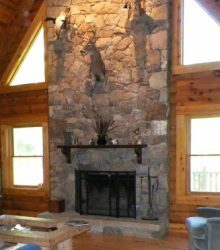 A rustic mantle on a dry stack stone fireplace. 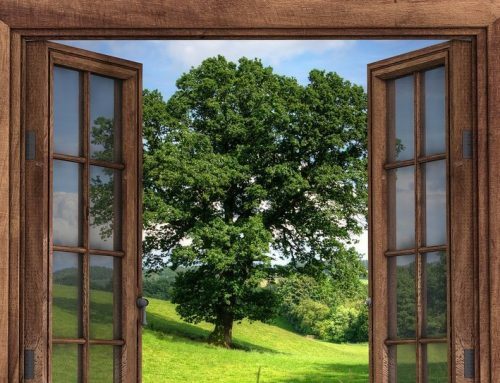 The mantle is a large timber, like those used in a timber frame or post and beam home. This fireplace mantle decor utilizes antiques. You could use family heirlooms or special antiques that you find on a treasure hunting trip. Of course you don’t always have to have a collection of one kind of decoration. You can mix and match rustic items that you like. For example, this fireplace mantle boasts a spinning wheel, with its vertical interest and interesting shape. It also has a basket with natural reeds and candles in various shapes and sizes. And, it works, because it is artistically done, without feeling like its a cluttered mass of “this and that”. If you look at this mantle, it is balanced, with a higher object at each end, and the spinning wheel, off center but in the middle. 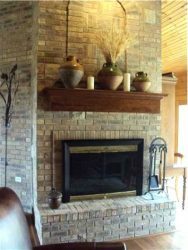 This mantle is stained dark, to accentuate it against the lighter colors of the rustic stone fireplace. 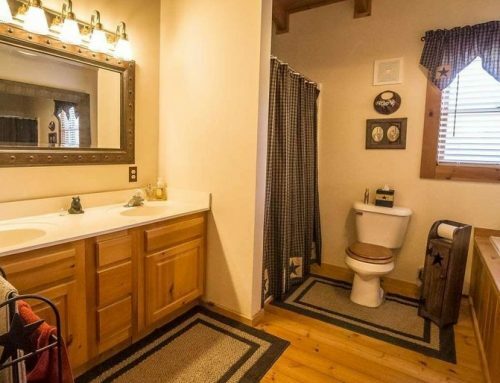 You’ll notice hunting trophies above the mantel. 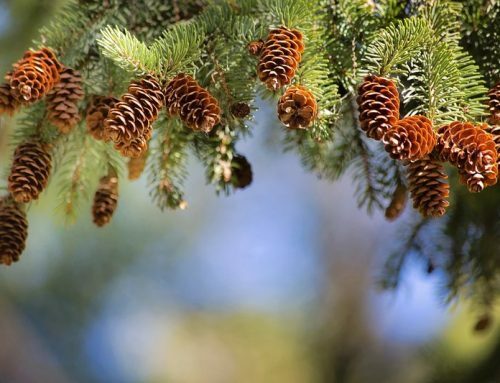 The mantle itself has natural objects, and, if you look closely, you’ll notice a balanced arrangement. The 3 heads are in a triangle pointing downward, and the items on the mantle also form a triangle, with the point facing upward. Subtle but there, and it does have a pleasing effect. When considering fireplace mantle decorating ideas, don’t forget to include lighting that will highlight special items. 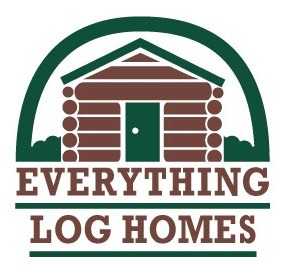 Log cabin lighting plans should be made early, as the lighting fixtures need to be installed early in the building process. Notice the dramatic effect of light directed at the fireplace. 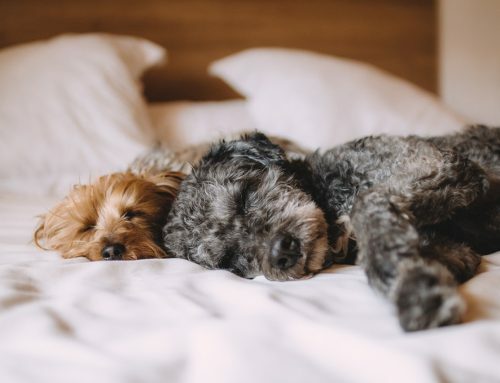 Do you have a large family with many kids and grandkids? Lots of pictures of your favorite people? You might choose to put your best photos on your rustic fireplace mantle? 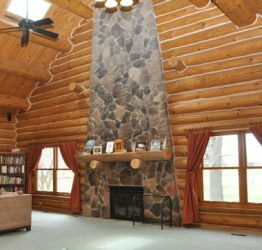 This log home, with its floor to ceiling fireplace, has a half round log mantle, with family photos. What are the things you love or those you love to do? This fireplace mantle is decorated with rustic loved items, including old fashioned snowshoes. 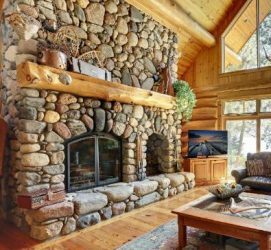 The rustic fireplace, rustic mantle and large windows help to bring together the inside and outside of this pretty log home. Well, maybe you can’t bring your sailboat indoors, but you can certainly enjoy a sailboat replica on your rustic fireplace mantle. Or any other motif of activities that you love. 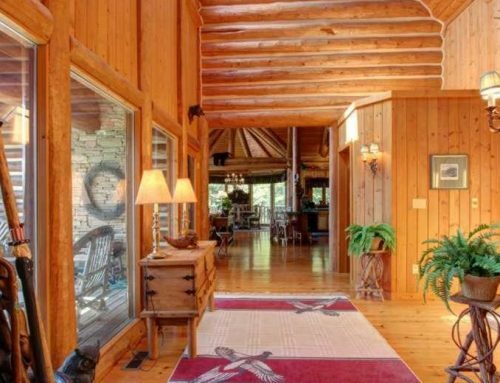 This log cabin is on a lake, and the owners enjoy beautiful views of the lake year-round. Using nautical decor here and there in their home complements the views from every window, that they enjoy so much. Different areas of the country have different customs and interests. 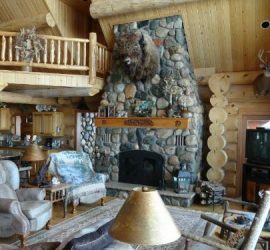 This log cabin, built in a western state, has a huge buffalo head over the rustic fireplace. The fireplace mantle decor is balanced and uncluttered. 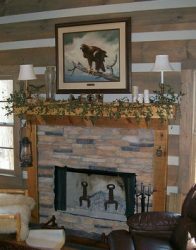 The mantle is a perfect place to display smaller Western items that complement the buffalo head theme. 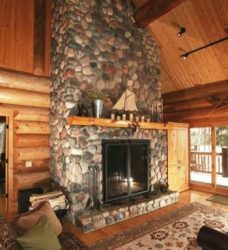 Note the large logs beside the fireplace, corner logs for a wall. There are so many adorable dinnerware plates with rustic themes! Your fireplace mantle decor is another great place to show them off. 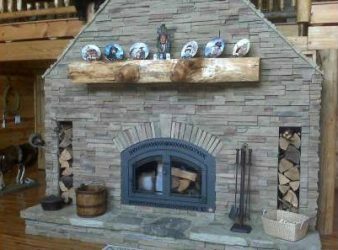 If this is what you plan to do, have your builder notch your rustic mantle, so that the plates will stay in place when you assemble your display. 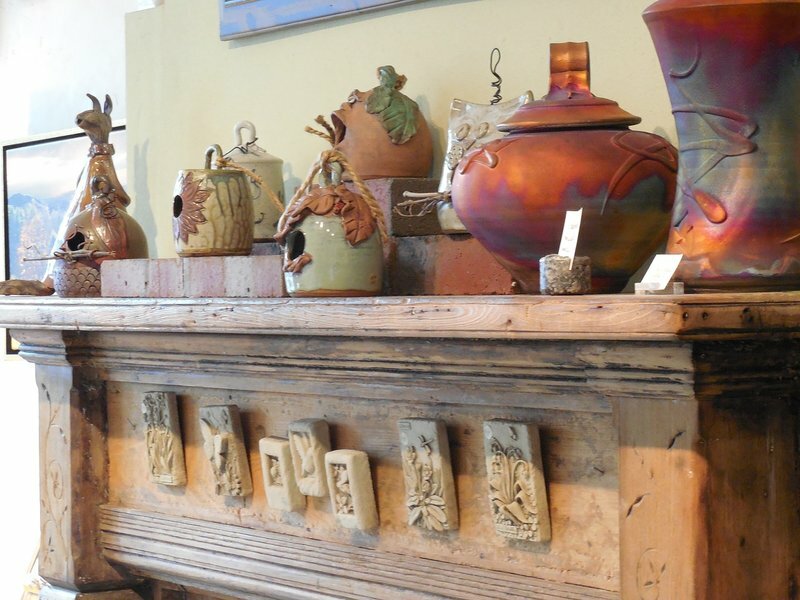 Tasteful and quite attractive, handmade pottery is a great display for a rustic fireplace mantle. This is a very simple display, using only a few pieces. Your fireplace mantle may be larger. In addition to the pottery on the mantle, consider replacing the black pot on the left part of the hearth, with a large pottery jug or pot, with a natural reed or silk flowers arrangement.